Lesson 5: The Universe: Creation or Chance? What is God's most wonderful creation? 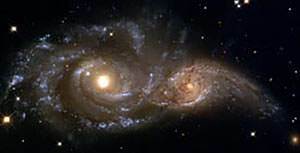 There are only two possible explanations for the universe: 1) It came into being by chance, or 2) It came into being by intelligent design; that is, God created it. What is the characteristic of something that comes into being by chance? Disorder. What is the characteristic of something that is the result of intelligent design? Order. For example, suppose I wish to set up 500 chairs in a gymnasium for a meeting. The chairs are stacked on one side of the gym. I decide just to throw them across the floor and leave it to chance that they will be arranged properly. If I throw 500 chairs across the gym floor, what do I get? I get a jumbled mass of chairs—total disorder. 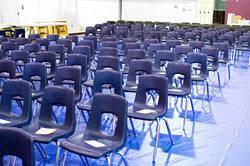 If I come into a gym and find 500 chairs perfectly lined up in rows, one row behind another in a precise pattern, I can be quite sure that this was not the result of chance. Someone with intelligence placed these chairs in a precise pattern according to a definite design. If the universe came into being by chance, what would we expect? We would expect disorder. But when we look out into the universe with powerful telescopes, what do we find? We find billions of stars and planets operating in precise patterns and perfect timing. We live in a fantastic universe. 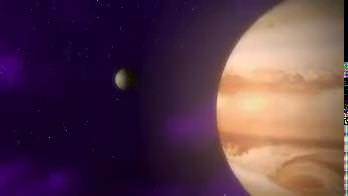 Our sun is so large that it could contain a million planets the size of our earth. And there are stars so large that they could easily contain 500 million suns the size of ours. The giant star, Antares, is said to be so large that if it were a hollow ball, and the sun and earth were put inside it, the earth could continue its orbit around the sun and never come halfway to the outer edge of Antares! Within the Milky Way, there are stars so great as to defy description—like Eta Carinae, which is 5 million times as bright as the sun. In the town hall in Copenhagen, Denmark, stands the world's most complicated clock. It took 40 years to build and it cost over a million dollars. It has fifteen thousand parts and computes the time of day, the days of the week, the months, the years, and the movements of the planets for 2,500 years! 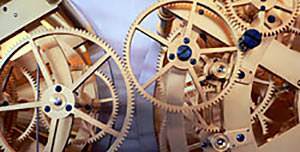 This amazing clock is probably the most accurate clock ever constructed, but it is not perfectly accurate. It loses 2/5 of a second every 300 years! Like all clocks it has to be regulated by the universe itself. The universe with its billions of moving parts is so accurate that all time on earth is measured by it. Surely such a precise universe is the result of intelligent design and not haphazard chance. Now let us take the most powerful microscopes and look into the microworld which is invisible to the human eye. Take a thin slice of wood and put it under a powerful microscope. We find that its structure is regular and orderly. Look at a leaf, a blade of grass, or a tiny flower. Each is flawless and finely fashioned. Put a snowflake under a powerful microscope and it glistens like beautiful jewelry. Even more wonderful, no two snowflakes are exactly alike; each is different, yet all follow the same general pattern. Surely this indicates design and not random chance. Suppose someone told you that a giant airliner, with its hundreds of thousands of parts, came into being accidentally. 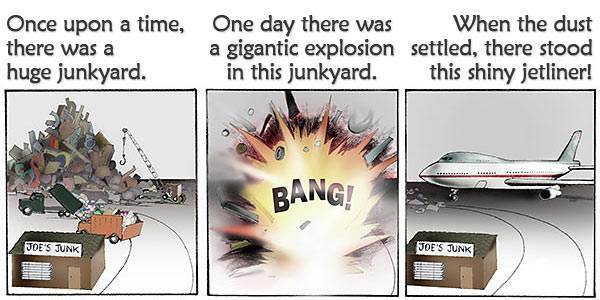 They explained that there was a tremendous explosion in a huge junkyard, and when all the dust settled, there stood a Boeing 747 jet airliner, ready to take off. Would you believe this? No, you would not! Amazingly, scientists who do not want to believe God's Word, teach the "Big Bang" theory. According to this theory, the universe, with its almost infinite complexity, came into being as a result of a gigantic explosion of "cosmic material" in space. This theory leaves two huge unanswered questions: Where did the "cosmic material" come from? What caused the "explosion"? God created it! 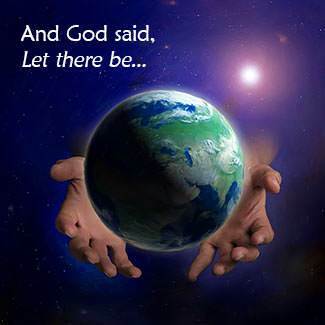 The very first sentence in the Bible says, "In the beginning God created the heavens and the earth" (Genesis 1:1). No one knows when God created the heavens and the earth. God has not told us when He created the universe, but He has told us how He created it. He spoke it into being. "By the word of the Lord were the heavens made; and all the host of them by the breath of His mouth… For He spoke, and it was done; He commanded, and it stood fast" (Psalm 33:6,9). The word "create" means to make something out of nothing. There was no "cosmic material" in space before God spoke. The Bible says, "Through faith we understand that the worlds were framed by the word of God, so that things which are seen were not made of things which do appear" (Hebrews 11:3). The universe did not come into being by itself, and neither did the earth. God said, "I have made the earth and created man upon it…" (Isaiah 45:12). The living creatures on the earth did not evolve from some miraculous, single cell of life over a period of billions of years. God created them! 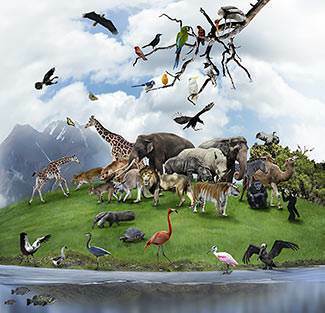 God created many different kinds of birds, fish, and animals. God told all the living creatures to "be fruitful and multiply after their kind." This is God's law of reproduction. Every living creature produces offspring or babies like itself. We came from God. The universe is not an "accident," and neither are we. God created the universe, and He created the first man. The Bible says, "The Lord God formed man of the dust of the ground, and breathed into his nostrils the breath of life; and man became a living soul [a living person]" (Genesis 2:7). God's most wonderful creation is man. Man did not come up from lower forms of life. Man was created as a "living person." Man is not God, nor a part of God, but he is the highest of all God's creatures because he was created "in the image of God." The Bible says, "So God created man in His own image, in the image of God created He him; male and female created He them" (Genesis 1:27). God is a trinity—Father, Son, and Holy Spirit. Man is a trinity also—body, soul, and spirit. What is the soul? The soul is myself! My body is just the "house" in which I live. Some day, my body will die, but my soul will live forever. Because we were created "in the image of God," we have something that no animal has. We have a spirit! The spirit is that part of us which can know God and receive His life. 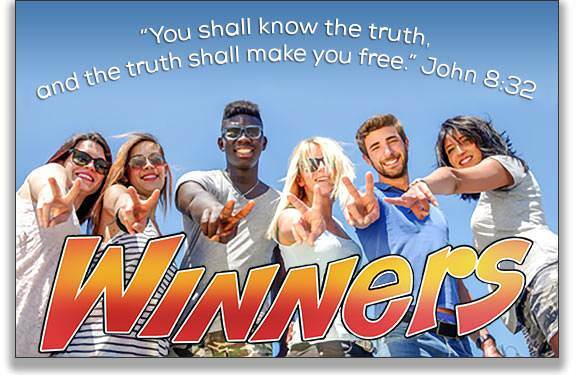 The most wonderful thing about us is this: God can live in us! God is a Spirit, and because we have a spirit, God can live in our spirit. There is nothing more wonderful than knowing God and having Him live in us. Adam is called God's "first man" because he was the first man—the head of the human family. God did not create millions of people to fill the earth. He created only one man, Adam, and one woman, Eve. From Adam and Eve came the whole human race. God placed Adam and Eve in a beautiful garden. We have never seen a garden as beautiful as this garden because it was planted by God Himself. This garden was not only beautiful, but it was filled with all the good things that Adam and Eve needed for food. God told Adam and Eve that they could freely eat of every tree in the garden except one—"the tree of knowledge of good and evil." God commanded them not to eat the fruit of this tree. God said that, if they disobeyed Him and ate the fruit of this tree, they would surely die. Adam and Eve were very happy in the beautiful garden which God had planted for them. In the cool of the evening, God came to walk and talk with them. This was the best thing of all. God was pleased with all that He had created. The Bible says, "God saw everything that He had made, and behold, it was Very Good" (Genesis 1:31). Why did God create man? God created man to love Him and to be loved by Him. Of all that God created, we human beings are the most important to God because we can know Him, we can love Him, and we can bring joy to His heart. God said, "…My delights were with the sons of men" (Proverbs 8:31). Because God created us, we belong to Him. The Bible says, "Know that the Lord He is God: it is He that has made us, and not we ourselves; we are His people, and the sheep of His pasture" (Psalm 100:3). Why did God create all things? The Bible tells us why God created all things. He created them for His glory and for His pleasure. Because He is the Creator of all things, God alone is worthy of all worship. The Bible says, "You are worthy, O Lord, to receive glory and honor and power: for You have created all things, and for Your pleasure they are and were created" (Revelation 4:11). The universe did not come into being by accident or by some giant explosion in space. God created it! The Bible says, "By the word of the Lord were the heavens made; and all the host of them by the breath of His mouth" (Psalm 33:6). God's most wonderful creation is man. We were created "in the image of God." Because He is the Creator of all things, God alone is worthy of all our love, praise, and worship. God had promised Abram (whose name God later changed to Abraham) that He would make of him a great nation. 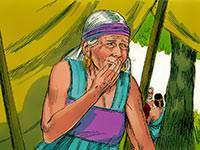 Abram had become wealthy, but he and Sarah had no children. Sarah was barren. She could not bear children. Since Abram and Sarah had no son, Abram asked God if his servant, Eliezer, was to be his heir. The Lord said to him, "This shall not be your heir; but he that shall come forth out of your own bowels [body] shall be your heir." 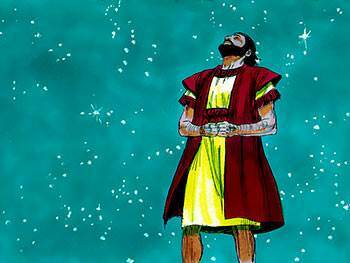 The Lord brought Abram out of his tent and said, "Look now toward heaven, and tell the stars, if you are able to number them." Then God said, "So shall your seed [offspring] be" (Genesis 15:5). Abram's situation looked impossible! He was 85 years old at this time and his wife could not have children. What was Abram going to do? Would he believe in his circumstances or would he believe God? Abram chose to believe God. The Bible says, "He believed in the Lord; and He [God] counted it to him for righteousness" (Genesis 15:6). Here we see the great principle on which we can be perfectly righteous before God—the principle of faith. When we believe God, He counts to us a perfect righteousness. Abram simply believed the faithful God who cannot lie, and God counted it to him for righteousness. Being declared righteous by God on the principle of faith may seem like a foolish principle to men, but it is God's principle. We are saved by grace through faith and faith alone. After a time, when Sarah had not conceived, she thought it would be good if she gave her maid, Hagar, to Abram, that he might have a son by her. Unfortunately, Abram went along with Sarah's idea. Hagar bore a son by Abram, and he was named Ishmael. But Ishmael was not the son which God had promised Abram. When Abram was 99 years old, God appeared to him and said, "I am the Almighty God; walk before Me, and be perfect." God made a covenant with Abram, renewing His promises to him. 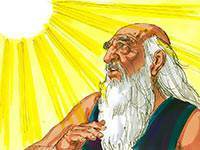 At that time, God changed Abram's name to Abraham which means "father of a multitude." God told Abraham and Sarah that they would have a son one year from that time. Sarah had not only been barren, but she was now long past the age of childbearing. She laughed at the thought of having a child. Abraham himself wondered how this could ever happen. But he believed God. Abraham is forever known as the man who believed God. The Bible says, "He staggered not at the promise of God through unbelief; but was strong in faith, giving glory to God" (Romans 4:20).